Spring (that’s the one right now!) - CS:GO and Rainbow Six Siege, no surprises there. Summer - CS:GO and Rainbow Six Siege aren’t going anywhere, but what’s that?! A new challenger approaches! For now, have to keep our lips (final) sealed, but that’ll be announced as and when! Winter is coming! - CS:GO will be staying, but as of now we cannot confirm the Rainbow Six Siege for all the seasons. There’s also a space for an additional title - what do you want it to be? We’re working on an ESL UK Discord server where all the teams and viewers can have an easier, more direct way of communicating with the ESL UK Staff. We’re hoping to promote more interaction between the community and the Staff working on the Premiership and an open communication channel for everyone involved. ESL UK is always looking to improve and make changes from your feedback. 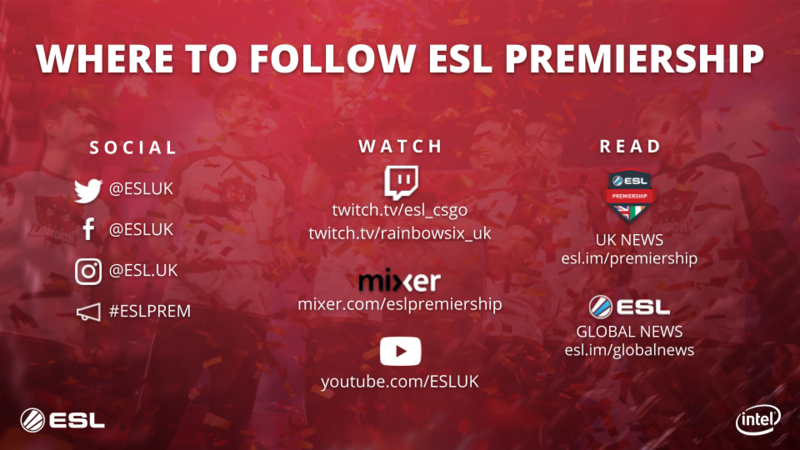 As well as taking the Premiership on tour, we’re looking to make the experience of following the ESL Premiership as exciting and involving as possible. Online Presence - We want to be able to bring the Premiership to you, even if you can’t tune in live on the day. We’re working on making the website more accessible and information filled - not just recaps, but interviews, player spotlights, news pieces from the world of the Premiership, and much more. We’re also keen on creating assets available for content creators, to bring consistency in the content that comes out regarding the Premiership. It benefits everyone, and when the logos and hashtags are correct, we are more than happy to share your content on our socials. Broadcast and social media - we want to make sure that the broadcasts and our social media aren’t just the matches - we’re striving to make the content as engaging as possible, and to give you a bigger insight of what’s really going on behind the tournament. We want to showcase the person that makes the player, making the competition more engaging and exciting for the viewer. We strive to bring the personalities and the drama - after all, what will make you root for someone, if not what’s behind the ign? We’ve been starting to make that happen at the Premiership Finals, creating interviews with the players there for social media, but we want to keep that going throughout the season. So if you’re a player and you see us reaching out to have a chat with you - don’t be alarmed! All we want to do is highlight who you are. After the introduction we had Scott Gillingham and Mark Broom, Intel, join us by calling in to the conference - they talked about the extended sponsorship globally and what it means to the local relationship between Intel and ESL UK. We had special guests, Kalvin Chung, Founder and Director of MnM and Peter Thompson, COO of Team Endpoint join us and have a conversation about what it’s like to run a UK organisation, the thought process behind their content creation and their plans and goals for the upcoming future. 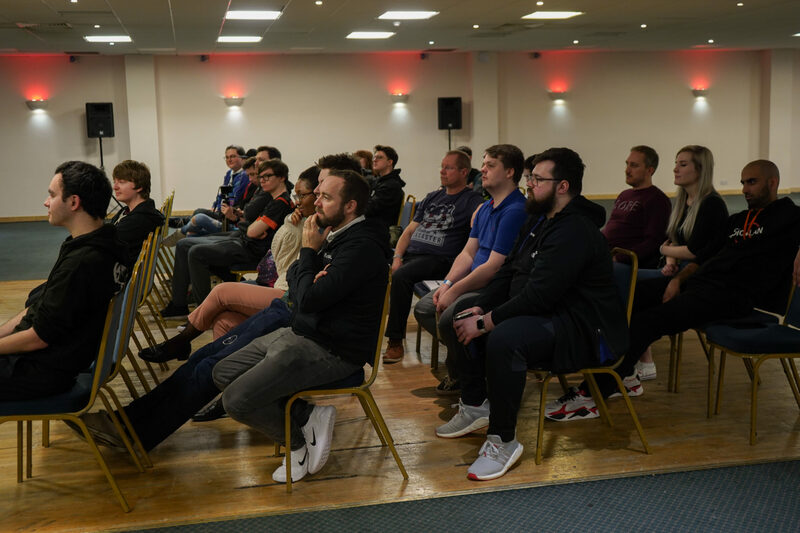 We also had a surprise guest, Lee Richmond, Head of IT at Leicester City Football Club, join James Dean, MD of ESL UK, in a chat about the future of esports in the UK and the future of esports growing alongside traditional sports. ‘We want to help out the kids as well. Kids that just sit in their room and don’t want to socialize, it’s , or they get into trouble’ said Richmond during the panel.